On the 24th April 2002 a group of 59 persons from Gharb went to Gerano, Italy where the official signing of the twinning agreement was held. The group leaded by the Mayor Mr David Apap spent a 6 day stay in this village, to integrate with the residents, share their lifestyle and experience their cultures. The group was given a hearty warm welcome by all Gerano residents which lasted throughout the whole stay. During the stay, the group participated in the village feast and assisted in the preparation of the Infiorata. Various official ceremonies were held other than that of the signing of the twinning agreement which took place on the 25th of April. Amongst others, there was the inauguration of a Social Centre which was named “Centro Sociale alla citta di Gharb” which centre was inaugurated by Gharb Mayor Mr David Apap. The Mayor of Gharb, inaugurated also a photographic exhibition with the theme “L’Infiorata piu’ antica d’Italia” and two folklor museums. During these ceremonies the Mayor Mr David Apap met various distinct personalities coming from the Italian Government amongst others the Honorable Francesco Storace, President of the Lazio Region, the Honorable Tommaso Luzzi, Vice-President – Consiglio Regionale Lazio and Senator Honorable Paolo Barelli. During the stay, the group visited also Rome, Subiaco and Tivoli. After the Signing of the Twinning Agreement, the Mayor of Gerano Mr Giorgio Fubelli donated to the Mayor of Gharb the Key of Gerano, symbolizing that the people of Gharb will always be welcome in Gerano. The activity related with the signing of the twinning agreement at Gharb is now scheduled to be held between the 3rd and 8th July, 2002 and the Gharb Local Council together with its sub-committee for twinning are working whole- heartedly to meet highly the requirements of this event. Before the Official Signing could take place, a lot of preparatory work was involved and there were also exchanges of delegations. In fact in July 2001 the first delegation of 9 persons from Gerano visited Gharb to consider the promotion of this twinning proposal between the two localities. During this event various activities were organised to introduce the delegation to the residents and the local groups. Visits to places of cultural and historical interest which in Gharb do not lack were also held. Even though the delegation stayed at Gharb for only four days the result was excellent and very promising. After this visit the Gerano Council confirmed their willingness to twin with Gharb and the Gharb Local Council was invited to send a delegation to Gerano. 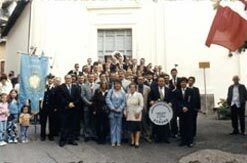 A delegation of ten persons including council members and representatives of local groups left for Gerano on the 13th September 2001. The Gharb group was impressed with the warm greeting that they were given. Various activities were organised in their honour and the delegation was taken on visit to interesting places not only in Gerano but also to Rome, Subiaco, Tivoli and surrounding cities. Before returning to Malta both Mayor’s signed an agreement which stated that they both promised each other that a twinning agreement will be signed. GHARB LOCAL COUNCIL PARTICIPATES IN INFIORATA HELD IN GERANO, ITALY In May 2004, Gerano, Gharb Local Council’s twinned Italian counterpart has been celebrating the 275th Anniversary of the ‘Madonna del Cuore’. In this occasion the Feast Committee amongst other initiatives has thought of organising a special infiorata. Gerano is famous for its Infiorata and is one of the oldest localities in Italy to hold this annual event. Usually the Infiorata or better a marvellous carpet made up of fresh flower petals forming various frames each symbolizing a different theme is held during the eve of the village feast dedicated to the ‘Madonna del Cuore’. This year on the night between the 8th and 9th May a special edition of the Infiorata has been held in the occasion of the 275th Anniversary where seven different localities, 6 from Italy and Gharb have been invited to do one of the frames of the Infiorata. For this reason a delegation from Gharb led by the Mayor Mr David Apap accompanied also by the Deputy Mayor Raymond Cassar and Councillor Sam Cefai visited Gerano to participate in this special event. Gharb’s Infiorata design was prepared by local artist Ruben Camilleri Cauchi who was also the leader of the flower makers. This unique experience has given the opportunity to all participants to learn the different techniques used in the preparation of the Infiorata in other localities. In Gharb the Infiorata has been held for the first time in the Maltese Islands in the occasion of Gharb’s village feast in July 2003 and the idea is to repeat this event each year in occasion of the feast. During the stay in Italy the Gharb group had to opportunity to integrate with the cultures and traditions of people living in small Italian mountainous villages as well visit places of cultural and religious interest such as Padre Pio, the Vatican, Rome and Tivoli amongst others. Gerano is a small village situated on the Tiburtini Mountains, with a distance of approximately 30 minutes drive from Rome, Italy’s capital city. Gerano is surrounded by chestnut tree woods. The population of this village is of 1220 and the area is of 10km2, both being very similar to those of Gharb. The feast of Gerano which is celebrated during the month of April, is dedicated to the “Madonna del Cuore”, to which the people of Gerano are very devoted. Gerano is renowned for the ‘Infiorata’ a marvellous carpet made of fresh flower petals which is prepared once yearly during the eve of the feast day, in honour of the “Madonna del Cuore”. 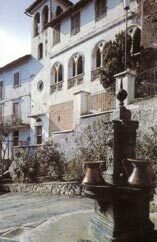 Although Gerano, like Gharb is a small community, the social aspect is quite high in the village, in fact there are a number of local groups and organisations and amongst others, a musical band “Amici della Musica”, the “Gruppo Infioratori” who take care of the preparation of the Infiorata, a choir “Schola Cantorum S. Maria”, a group to promote culture “Trellanum” and the “Pro-Loco” group who organise both religious and traditional feasts in the locality. Gerano has also its local football team.